Acer KG1, Nitro, and Predator are designed to cater to whatever the gamer in you needs. Acer Ranges keep all gamers in mind from the most casual gamer to the Professional gamers, Acer will meet your needs! Acer Gaming Monitors are designed for revolutionary gaming performance. 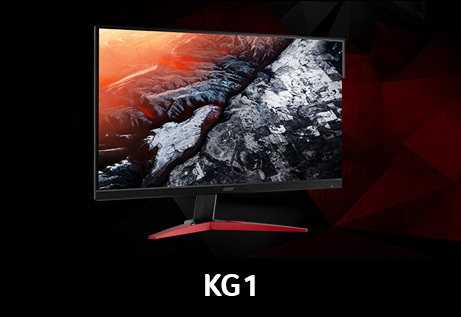 Start your gaming setup with a sleek, stylish KG Series gaming Monitor. Choose from a wide range of resolutions from Full HD up to 4K UHD. Take in the full view of the display with the Zero Frame designs and the sharply-cut three-pronged stand. A quick response of 1ms, means images refresh quickly, making your gaming sessions seamless and enjoyable. 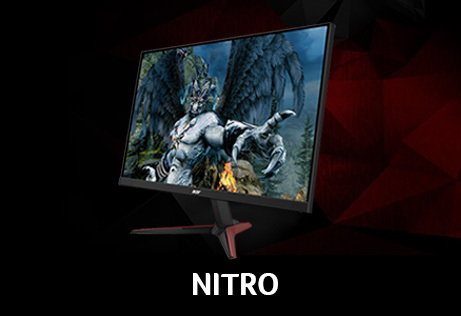 Boost your Gaming setup with a new Nitro Gaming Monitor. Have a seamless game experience through Radeon™ FreeSync—in vivid IPS—and the blur free viewing of a 1ms Visual Response Boost. Get the Adrenaline-fueled joyride you’ve always wanted. Slam the thrusters and boost up to top speed. Acer Predator offers a wide range of choices for your gaming needs from 60Hz to 240Hz Refresh Rates, Full HD to 4K Resolution, TN-VA and IPS Panels. Take your pick for your Gaming setup with options of a Flat Panel Predator Gaming Monitor or a more Immersive Curved Predator Gaming Monitor.